The Word: Something different, and great swimming! Sun/shade: Sun nearly all day, although Mother of Pearl's corner stays shady until midday. Wet weather options: Definitely not. Style & Length of Climbs: 50-180m. Mainly hard slabbing on very low angled but incredibly polished rock, but with some easier corner/crack routes. 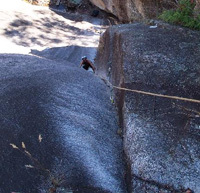 Not an amazing crag by Buffalo standards, but surprisingly worthwhile nevertheless, with totally unique climbing on super smooth pearly white water washed granite. The 23s and 24s here look awesome, as does No Holds Barred (** 21). In For a Swim (* 15) with a creek crossing and swimming hole at the first belay looks fantastic!! Pitch 1 and the creek crossing at the first belay generally stay dry thanks to the pool draining out through a narrow channel, however the flakes on pitch 2 receive flow unless the creek is quite low so it's best left for a drier season - nevertheless it's on my "must do" list and I'll be living up to the route name for sure!! Being way down near the bottom of the hill, temperatures down here can be expected to be several degrees warmer than up on the plateau. However the fantastic swimming holes at the bottom and top of the crag, and even halfway up one of the routes easily compensate for this, and add significantly to the experience!! A good choice for some long easy slab wandering followed/interrupted by a dip, and it can help break the drive too if you're just arriving or just leaving. Access: Walk up the Eurobin Falls tourist track to the end (10mins). A great first pitch up a fingers corner crack, followed by long slabbing sections. Despite easing considerably after the first pitch, this route stays interesting the whole way thanks to the views up to the Gorge, the waterfall 50m off to the right, the excellent inviting swimming holes at the top and bottom of the crag - and the long runouts! Starts up the major corner about 70m L of the base of the waterfall. 1) (** 25m 14) A great well protected pitch up a thin corner crack to belay off equalised small trees and gear in a thin vertical crack in the left wall. 2) (55m 10) The wide corner for 7m to a major vertical offwidth crack in the left wall (taken by Banglanoid 18). Place gear here (eg large cam in offwidth or hexes inside the corner), then traverse 3m R to the top of the thin flake. Very easy (hands free!) 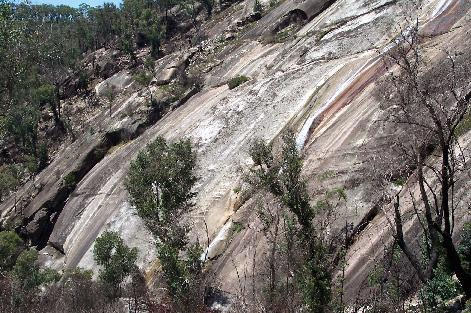 but run out slabbing on featured rock for ~25m staying R of the vegetation regains the corner. More easy slabbing up beside corner to the "halfway ledge", not much of a ledge but distinguishable by a scramble-off being possible to the left and a rap chain 15m across R. Belay at top of corner off equalised small trees (or over at the chain if your rope reaches). 3) (45m 3) Traverse R to the chains (rap descent possible here - 2 double rope raps??) and continue R past the vegetation until possible to step up off ledge. Wander 20m up any of the cracks to a landing below the final polished slab (large cam belay 25m R of corner). 4) (60m 8) Up the polished slab following the path of least resistance, nice but no pro. Could be easier or harder depending on your line. The corner on the L would be better protected but possibly a little harder and can seep. To descend, head R (facing the cliff), cross the creek (good swimming holes here but don't underestimate the slipperiness of the rock near the edge) and down the far R end.